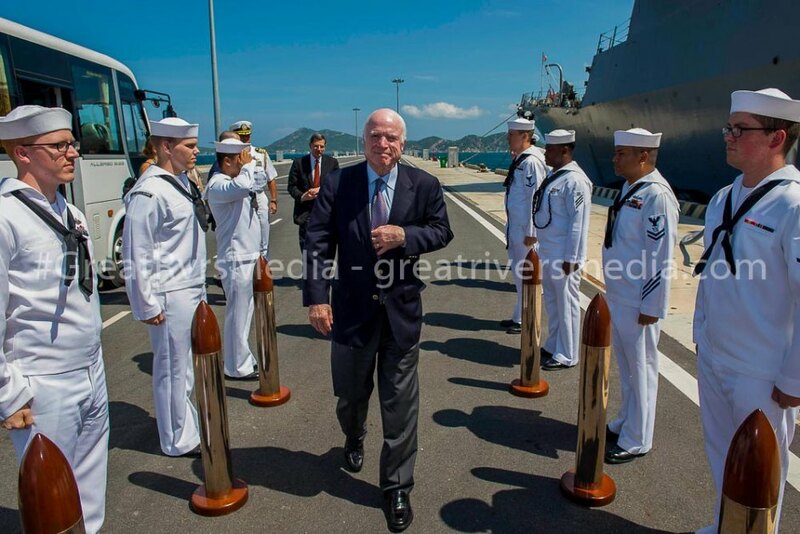 CAM RANH, Vietnam - Sen. John S. McCain III is piped aboard during a visit to the Arleigh Burke-class guided-missile destroyer USS John S. McCain (DDG 56) in Cam Ranh, Vietnam, June 2, 2017. Arizona Senator John McCain is the 2017 recipient of the Liberty Medal awarded by the National Constitution Center. Philadelphia's National Constitution Center is the only institution in America established by Congress to “disseminate information about the United States Constitution on a non-partisan basis in order to increase the awareness and understanding of the Constitution among the American people.” Established in 1988 to commemorate the bicentennial of the U.S. Constitution, the Liberty Medal is awarded annually to men and women of courage and conviction who strive to secure the blessings of liberty to people around the globe. "Thank you, Joe, my old, dear friend, for those mostly undeserved kind words. Vice President Biden and I have known each other for a lot of years now, more than forty, if you’re counting. We knew each other back when we were young and handsome and smarter than everyone else but were too modest to say so. Thank you again for this honor. I’ll treasure it."